“…Forgive us our sins, for we also forgive everyone who has wronged us…” – from the prayer Jesus taught his disciples according to St. Luke’s account (11:4). This statement, or something near it, is uttered by the lips of most Christians on a weekly, and for some, daily basis. We entreat the God who gives daily bread to forgive our wrongs. In Matthew’s rendering of Jesus’ teaching, that is the only part of the prayer that Jesus returns to immediately in order to exegete: “If you forgive others their sins, your heavenly Father will also forgive you. But if you don’t forgive others, neither will your Father forgive your sins” (6:14). The ‘for’ [of Luke 11:4b] does not introduce a relationship of quid pro quo between divine and human forgiveness, as though God’s forgiveness were dependent upon human activity (6:35; 23:34!). Instead, Jesus grounds the disciples’ request for divine forgiveness in their own practices of extending forgiveness. As in previous texts (esp. 6:36), Jesus spins human behavior from the cloth of divine behavior; the embodiment of forgiveness in the practices of Jesus’ followers is a manifestation and imitation of God’s own character. The image conveyed here is that of an open or closed hand. If you clinch your fists in holding a defiant grudge, they are not open to receive divine forgiveness either, for forgiveness can only flow through extended arms and open hands (viz. Christ on the cross). Forgiveness is a significant word in the vocabulary of those of us who claim to have been recipients of Divine forgiveness. We who embrace the forgiveness offered by the crucified One who cried out to his God, “Father, forgive them for they know not what they do…” find that as we have been forgiven, we are expected to be forgivers when others offend us. Yet what I witness and even feel in many encounters and my own experience where a wrong or injustice has been done is that forgiveness is a term that though often used, is rarely understood or expressed in the delicate yet precarious way I perceive it to be offered by our Lord. Simon Wiesenthal, an Austrian Jew and Holocaust survivor, in his book entitled The Sunflower: On the Possibilities and Limits of Forgiveness recounted a time when he was randomly called to the bedside of a dying Nazi soldier. When Wiesenthal entered the room the patient begged for his forgiveness for atrocities he had committed in his life, particularly of an incident where he took part in the mass murder in a building housing about 300 Jews. This soldier and his comrades had set fire to the building and as Jews tried to escape the flames, they gunned the victims down. Being haunted by the tremendous guilt for participating in such a despicable act and knocking on death’s door himself, the fear of eternal punishment crept in upon this man who begged for “any Jew” to come and absolve him. Wiesenthal listened to his confession, but left the room (never to return) without saying a word. Wiesenthal pondered and invited the reader to respond to the question of whether his silence was justified or if he should have offered words of judgment or forgiveness to the soldier. His plea for feedback regarding the predicament he faced garnered hundreds of deeply intriguing responses from people of various backgrounds all across the world. I highly recommend my readers to pick up a copy of the work and wrestle with the dilemma, because as the subtitle suggests, the situation raises not solely the question of whether he should have forgiven the soldier, but even challenges the presupposition that he could have done so. The (real or hypothetical) possibility or impossibility of absolving such a person varies according to the worldview of those who have responded and their replies will surprise you, I think. 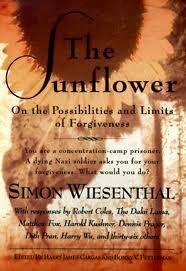 Wiesenthal’s dilemma brings to the surface the significant differences of people’s approaches to forgiveness. If you think that Wiesenthal not only could have but should have said, “Yes, I forgive you” with ease and then gone on back to his imprisoned livelihood under evil’s grip, then I think you’re greatly underestimating the true costliness of forgiveness. Yet what I hear in the court of public opinion when someone has committed some terrible act or spewed some poisonous and hateful words and it appears in media outlets is that very idea. And forgiveness appears to be packaged that way not only by those advocating for the absolution of the offender but also by those who call for his or her head on a platter. Forgiving someone, in this seeming popular sense, means giving them a clean slate, a free pass, maybe even desiring to let them pick up where they left off before the offense was brought to light. But forgiveness, as I see it, is not a mere free pass; else we could call it cheap grace. It’s not a blank slate, although to some degree we might call it a second chance. Forgiveness is rarely an instantaneous thing like a simple transaction and is not a merely static reality. Forgiveness, like giving birth or being born, takes time and requires the giving up of something valuable (by both the forgiver and the forgiven) in order to be fully experienced. I remember being taught that the best way to define justification (a word commonly interchanged with forgiveness in theological circles) as “It is ‘just (as) if I’d‘ never sinned.” Now that’s a clever play on words and gets some of the concept, but ultimately this cliched slogan is insufficient, for it fails to truly wrestle with the reality and depth of the consequences of humanity’s proliferation of injustice, immoral behavior and evil. It also often fails in that it tends to see forgiveness as an end in itself rather than as a means to a more perfect goal: the real change that comes from the Divine life implanted within. Although this isn’t always true, it is generally the case that Eastern and Western cultures approach the agents and actions of forgiveness quite differently. A big difference lies in the expected answer to the question: Who takes the first step toward forgiveness and reconciliation: the offended party or the victim(ized) party? In most Western paradigms, forgiveness is potential when the offending party approaches the victim(s), expresses sorrow and asks to be forgiven. Forgiveness is achieved if the request is granted. In many Eastern paradigms, I’ve been told that forgiveness is an offer given by the victim(s) in approaching the party who offended [them]. Now consider the paradigm at work in Christ’s ministry of forgiveness, reconciliation, and wholeness. Real forgiveness means looking steadily at the sin, the sin that is left over without any excuse, after all allowances have been made, and seeing it in all its horror, dirt, meanness, and malice, and nevertheless being wholly reconciled to the [person] who had done it. That, and only that, is forgiveness, and that we can always have from God if we ask for it. And that, sisters and brothers, opens a window into the unique nature of this divine forgiveness in which we are called to participate. For in the holy mystery that these words accompany, we will discover that forgiveness is much more than an emotional feeling or expression but is a sacramental act that came and comes at such a terrible and great cost. Thanks be to God! Once again you amaze me with your knowledge and insight! I totally agree that human actions and behavior do not change the character of God. It’s not that God won’t forgive if we don’t forgive those who have wronged us but that we can’t experience God’s forgiveness if we don’t forgive. Our failure to forgive dams up the flow of God’s forgiveness? That’s exactly how I see it! Love you, dear friend!